1. G.O.Ms.No.174, HM&FW (M2)Department, dated: 01.11.2013. 2. G.O.Ms.No.175, HM&FW (M2)Department, dated: 01.11.2013.
processing of bills by the DDOs and the Treasuries, preparation of accounts, maintenance of electronic data, etc. 2. The Human Resources Management System (HRMS) is also included in the CFMS Project for the benefit of all government employees. 3. In the G.Os first and second read above, the Government has issued orders introducing the Employees’ Health Scheme (EHS) and issue of Health Cards to the employees, their family members and dependents, for cashless treatment at empanelled hospitals. 4. In order to implement the HRMS and issue of Health Cards, the Government has decided to collect the data of all Government Employees online through a Web-based application established by the Finance Department Portal. It has been decided to collect the data directly from all the Drawing and Disbursing Officers (DDOs) to obviate delay in the matter. So, All The DDOs in the State completed the data entry of all their Government Employees /all types of employees Online through a Web-based application. The Employee Who were submitted their entire information relating to himself / herself by certifying the CFMS datasheet that would be provided by their DDO. 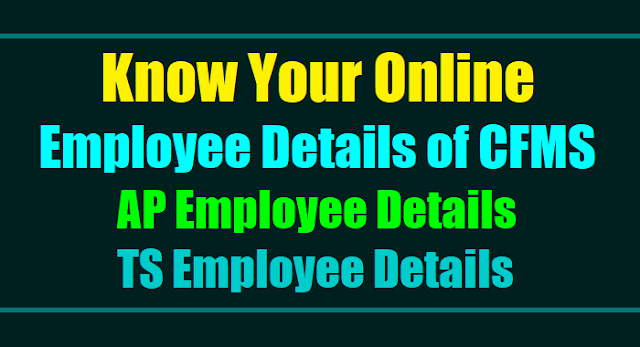 They Can Download their CFMS Employee Details on Finance Departmental Official Website. First Visit to Finance Departmental Official Website by entering the http://fdhrms.cgg.gov.in/DownloadEmpDetails.do in search box. Then select your Employee type Regular / Grant In Aid / Contract / WorkCharged / Out Sourced / NMR / Home Guard. Enter Your Date of Entry into Service(For Contract And OutSourced Employees Enter Contract Start Date). Click on Get Data Button. Then Display the list of employees. Choose your Employee Id and Your Name. Now Download Your Details of PDF File.